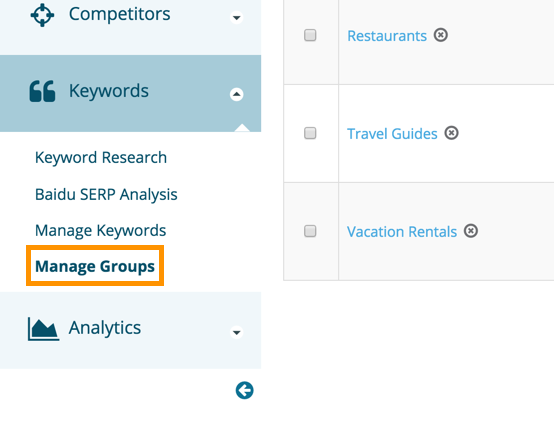 To create a new keyword group, first navigate to the Manage Groups page under Keyword in the left navigation. On the Keyword Groups page, click on the Add Keyword Group button. Give the keyword group a name. 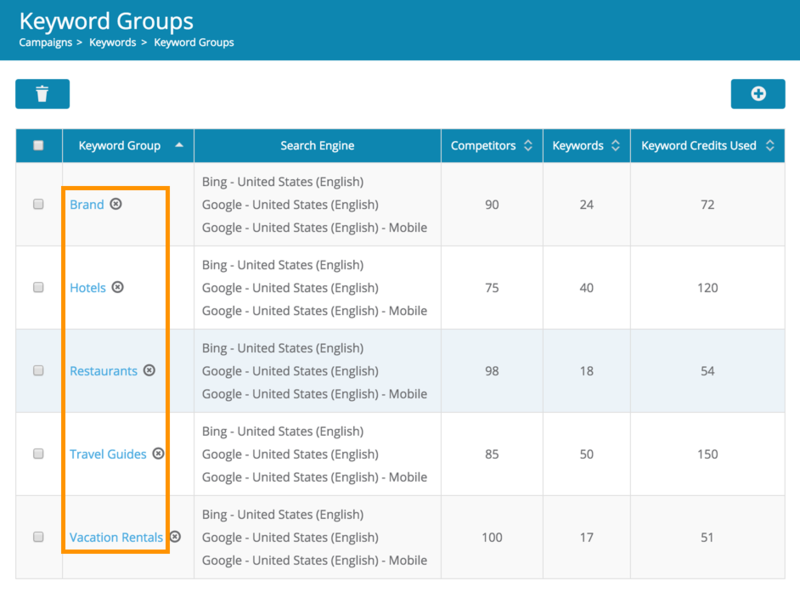 Keyword group names must be unique inside each campaign, but can share the same name of a keyword group in a different campaign. Right below the Keyword Group name text box you can see the available keyword and competitor credits for this campaign, you can reference these information to makes sure you don't overspend on your keyword and competitor credits. Each keyword group will track keywords in one or more search engines. Though there's no limit to the number of search engines you can add for a keyword group, each keyword / search engine combination counts as one keyword. This means that 100 keyword credits would allow you to track 20 keywords in 5 search engines, 50 keywords in 2 search engines, 50 keywords in 1 search engine for both desktop and mobile devices, 25 keywords in 2 search engines with 4 different locations for 1 device or some other configuration. For this reason, it may be wise to separate keyword groups by language, since it typically is not useful to track keywords of one language in a search engine of a different language, however doing so will still cost keyword credits. For example, instead of tracking a list of 50 English and 50 French keywords in a single keyword group with Google.com (English) and Google.fr (French), which will cost 200 credits (100 keywords * 2 search engines), consider tracking the English keywords in one keyword group with only Google.com (English), and the French keywords in another keyword group with only Google.fr (French). This way will only cost 100 credits ([50 keywords * 1 search engine] + [50 keywords * 1 search engine]). The same logic applies on Device / Location based tracking, you may want to only track mobile device for keywords that drove conversions on mobile devices, or track local search engines based on your website's business physical locations etc. Choose which search engines you'd like to track in this keyword group by first choosing the engine. The Search Engine dropdown will narrow to the available region and language for this search engine. Similarly, the region - language dropdown will narrow to the available devices, after choosing devices, you will need to choose your preferred tracking location. If you leave the location field untouched, we will track national rankings based on your selected search engine. Dragon Metrics supports tracking in over 10 search engines in most regions and languages for both desktop and mobile devices in almost 90K different locales. If for some reason you don't see the search engine / region / language / device / location you're looking for, contact us, and we should be able to add it fairly quickly. To add additional search engines, click the + button to the left of the row. Similarly, to remove a search engine, click the - button to the left of the search engine you'd like to remove. If your campaign have existing keyword groups, we will reference them to recommend search engines to track. Now it's time to add keywords to the keyword group. 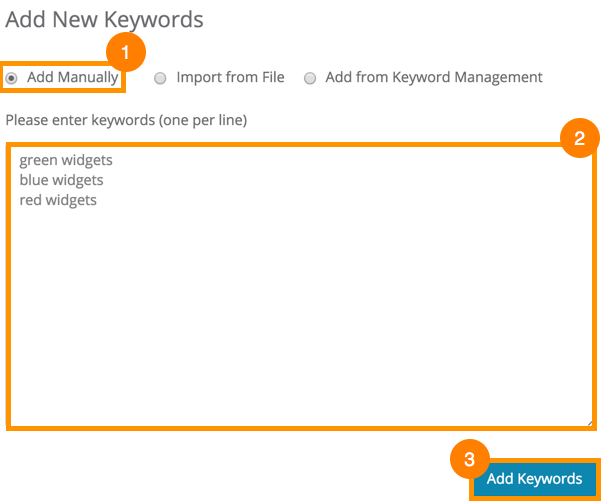 There are three options for adding keywords, all available by clicking on each radial button. When adding keywords using any of these methods, you'll need to be familiar with the fields associated with keywords. This is an optional translation of the keyword in another language of your choice. This is often useful for international teams that may need to manage reporting on campaigns with keywords in languages they may not understand. If you don't already have a translation for the keywords, consider pasting them into a service such as Google Translate to quickly perform a machine translation. The translation may not be technically perfect, but could still provide useful context for international teams. Search Volume is the number of times a keyword are being searched for each month. You can use the Get Search Volume button above to get this Search Volume data for Google, Bing or Baidu, many keyword tools such as Google AdWords Keyword Planner can provide the search volume for keywords as well. If included, they can appear alongside ranking data and other areas throughout Dragon Metrics. 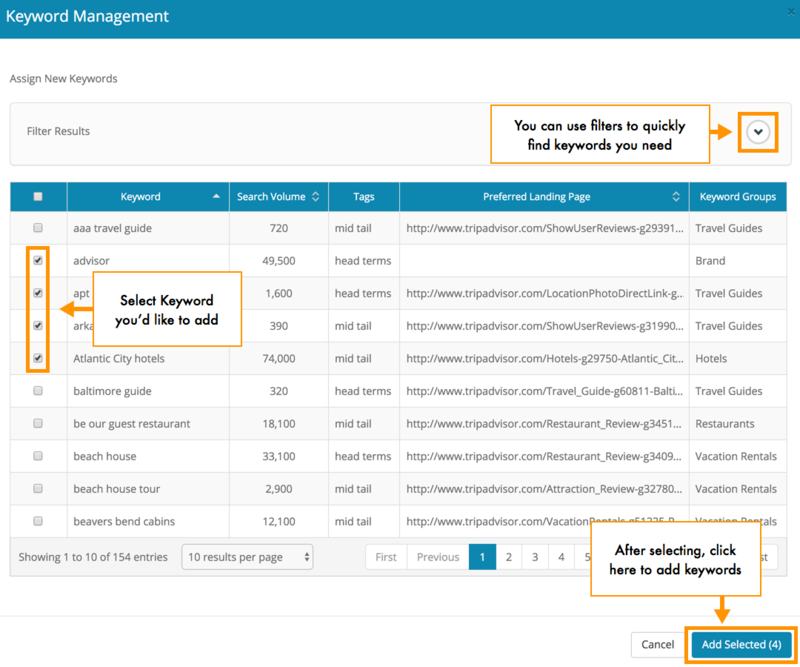 Note: Keywords added through the Keyword Research tool will automatically include search volumes. The quickest way to add large numbers of keywords is to upload a file containing your keyword data. To do so, download the Excel file we've provided, enter in your keyword data, save the file, and upload it using the form. Remember, when filling out the document, that only the "Keyword" field is required. Once the file has uploaded, a screen will show the results of the upload or any errors encountered. 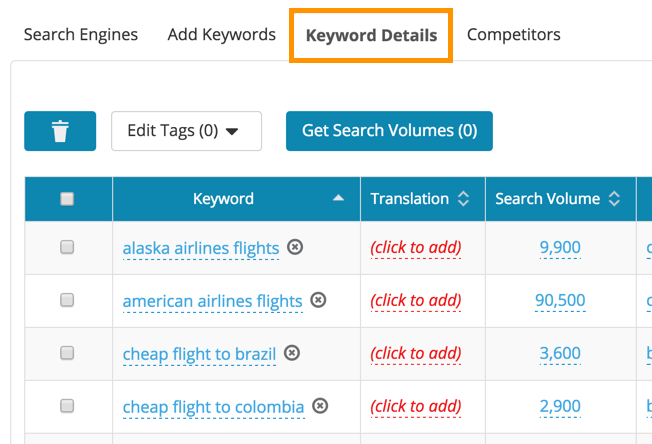 If you've already added keywords to the Keyword Management area, you can import them directly into this keyword group. In the pop-up window, simply select the keywords you'd like to add to the keyword group and click Add Selected. You can also search for keywords by using the filter at the top. You may also add keywords manually one-by-one. Begin by adding keywords into the text box, one per line. Click Continue when you're finished. You'll then be presented with a screen where you can add or confirm any (optional) keyword details. After you've added some keywords, you can still make changes to the list before saving. To add more keywords, simply follow the process above again. To delete keywords, click on the x icon at the end of each keyword or check the box next to the keyword click the bin icon button above. The last step is to add competitor domains to track along with the site's main domain. If you don't know which competitors you'd like to track at this point, you can let Dragon Metrics discover them automatically for you using Competitor Analysis, and add them at later time. If your campaign have existing keyword groups, we will import competitors from them automatically for you. If you click on the import from existing competitors button, you can see them appear in the box in the left. To add them to this keyword group, select them (using ctrl + click to select multiples) and click the right arrow. 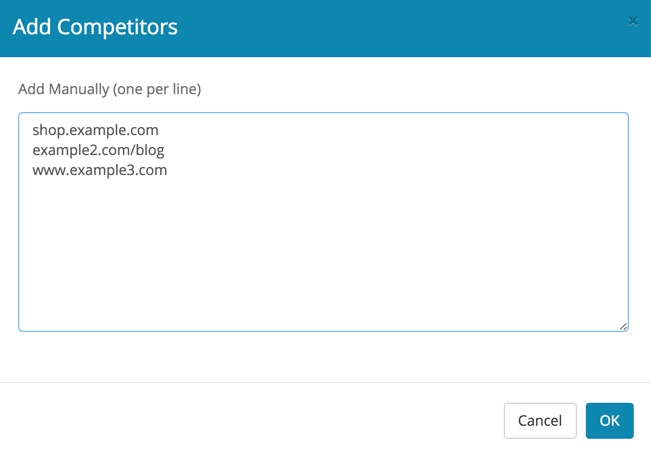 To manually add new competitor domains, simply type them one per line. Remember, including subdomains or subdirectories will limit the scope of the website. When you're finished adding competitors, click OK to close the popup window. After setting up name, search engines, keywords and competitors, you can click Save to finish up. If you've entered more keywords or competitors than you have credits for, you'll have to remove some before being allowed to save. Otherwise, you should be all set! It's easy to make changes to a keyword group after it's been created. Simply navigate to the Manage Groups under the Keyword area in the left navigation. Once you're there, click on the keyword group name you'd like to modify. You'll be taken to the Keyword Group Details page where you can make changes in the same way when creating a keyword group.